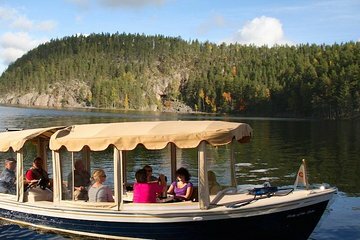 Experience the scenic splendor of Kolovesi National Park in Finland's southern Savonia region on a 3-hour private sightseeing cruise, with a professional skipper-guide. Settle into a leather-seated, eco-friendly electric boat and relish the views and peace as your boat cruises silently around Kolovesi’s mirror-glass lakes and waterways. Watch for rare Saimaa ringed seals and other wildlife; stop to inspect 5,000-year-old rock paintings on Ukonvuori Hill; and sip coffee as you cruise. If you wish, opt to meet a Finnish shaman and enjoy Finnish accordion tunes played by your skipper.